If you have excess dough, you can cut it off and roll it into thin, long braids. 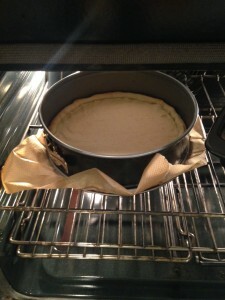 When put around the edges of the dough, they can help hold the ingredients that will soon be on top. The Erdbeer-Gateau or Strawberry Cake is a delicious and easy recipe. 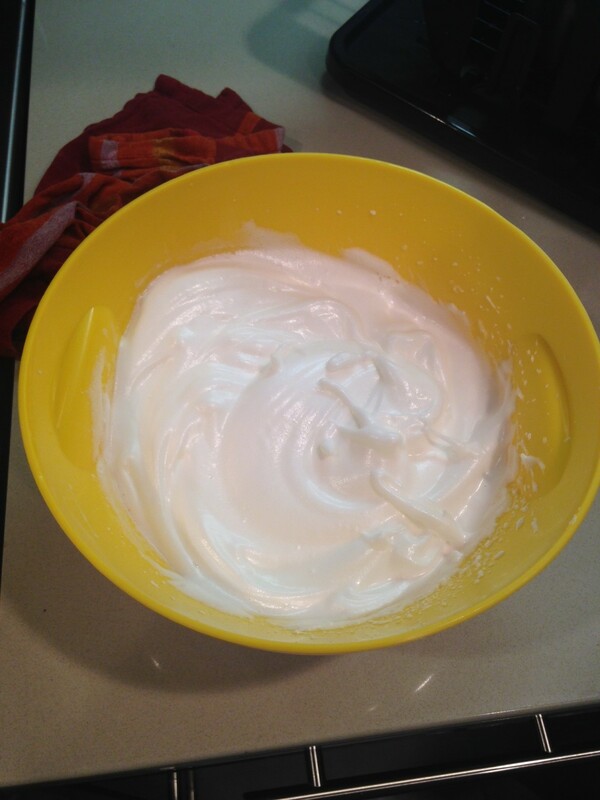 Don’t let any personal fears of working with meringue dissuade you! It’s perfect for summer. This recipe comes from a German-language cookbook published in Arad, Romania, in 1924. At the time Arad had a significant German minority population and also was an important seat in the world for Reform Judaism, for part of the German minority was also Jewish. You can read more about the cookbook we are discussing here. It’s an interesting story in itself. All that to say, this is not a recipe from a “Jewish cookbook,” rather a German cookbook that was published by a German press in Romania. The owner of the cookbook was a Jewish woman from Vienna, and that is how it found its way into our collections. “Klar” is either an old or regional German word for egg whites, and “Schnee” or “Eischnee” is meringue in German. I am very lucky to have a friend with a scale that weighs things in the European measurements, so we don’t have to worry about translating to cups, teaspoons, or ounces and pounds. Of course, many of us reading this recipe do need to do this. Though the directions are sparse, again with the assumption the baker will know the basics of the kitchen, we didn’t need to supplement our knowledge too much. The mixing of the ingredients for the dough is easy: a stick and a half of butter, sugar, flour, and two egg yolks. 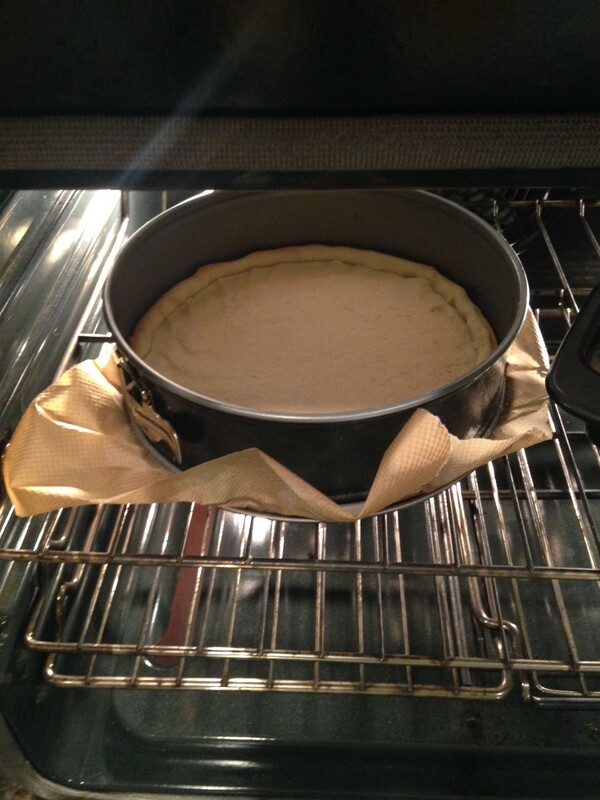 Then you roll it out and, using a circular form pressed into the dough, made a circle. My friend, who is actually an excellent baker, took the excess cut off and rolled them into thin, long braids, which she then put around the edges of the dough to help hold the ingredients that would soon be on top. Perfecting the delight of the Erdbeer-Gateau: a warm summer day, a shady garden, and a friend to share it with. Following the directions we then baked this thin and circular dough on a baking sheet in the oven until it browned a bit, at 375 degrees Fahrenheit for about 20 minutes. Without my German friend I (an English-speaking American) would have had some trouble. “Klar” is either an old or regional German word for egg whites, which I didn’t know. And “Schnee” or “Eischnee” is meringue in German. 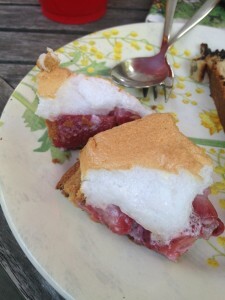 We cut up a number of strawberries and then created the meringue. 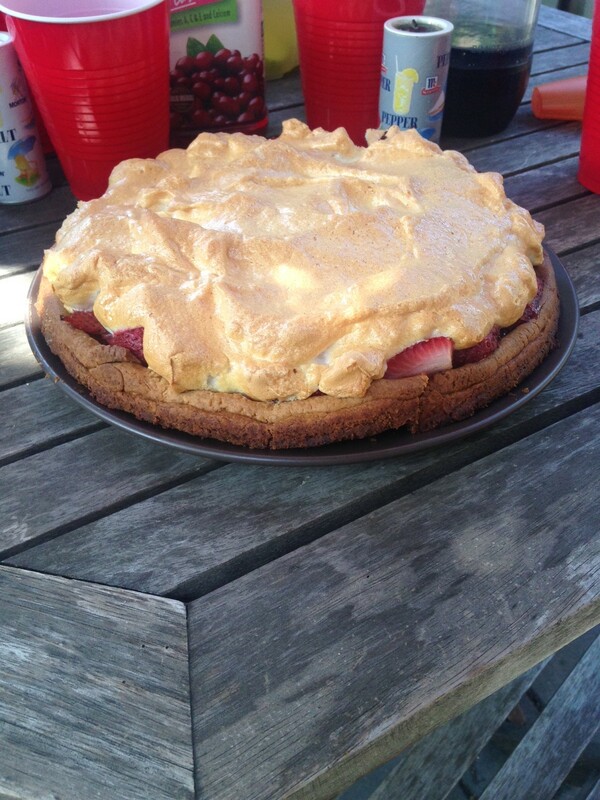 We then put the strawberry pieces on top of the dough, put the meringue over the strawberries, and baked the entire thing. We had the temperature at 375 degrees for fifteen minutes. We then turned the oven off and let the cake remain in the oven another half hour or so. When it was done we brought it out to the back garden and had a piece. It was delicious! I helped myself to a second. It was a nice warm day–perfect for a fruit cake with meringue. I would highly recommend this recipe to anyone who wants a nice summer dessert to serve guests. I know I will make this again, and happily so.